Misfits and malcontents, killers and crazies, this uniquely sums up the members of Task Force X, the Government funded black ops team of incarcerated Supervillains given a chance for clemency if they agree to take on secret missions so dangerous, that they are essentially deemed suicidal. Cast: Will Smith, Jared Leto, Margot Robbie, Viola Davis, Joel Kinnaman, Cara Delevingne, Karen Fukuhara, Jay Hernandez, Jai Courtney, Adewale Akinnuoye-Agbaje. Written and Directed by: David Ayer. Award winning director David Ayer presents us with, very possibly, the most fun and over the top comic-book movie of all time. Suicide Squad quite literally is a blast, from zany start to action packed finish, at times it’s like a live action Warner Bros cartoon, and it’s all the better for it. Ayer expertly shows everyone how to adapt a well loved, violently recalcitrant and anti-authoritarian comic book onto the big screen and make it an exquisitely enjoyable experience. The one thing that makes this cinematic excursion unique amongst its peers, is the virtual lack of actual Superheroes, unlike it’s filmic kin, Suicide Squad follows the path of the bad guys, the worst of the worst. That’s not to say that the movie completely lacks the capes and cowls of previous comic-book adaptations, both Batman and The Flash make very brief appearances, but are used primarily as a plot device to introduce us to the real stars of the show… the Supervillains. Let’s get straight to the most important part of the movie, the miscreants themselves, and with this in mind the most divisive, but one of the most impressive performances is Jared Leto’s take on the The Clown Prince of Crime. Jared’s Joker is an unpredictable and dangerous sociopath, in context to Heath Ledger’s (equally impressive) take, Leto’s rendering feels a lot more deranged and murderous, much more akin to the comic-book original. And though his time in the movie is short, he shines brightly with homicidal intent. The rest of the cast consists of seasoned actors and relative newcomers to the fine art of the thespian, chief amongst these is Will Smith’s rendition of the world’s greatest assassin (and Batman foe) Deadshot. His performance is both heavily dramatic, but also highly comedic, a blend that only someone of Smith’s consummate acting skill could pull off, he nails the character perfectly and is without a doubt a huge highlight of the film. Margot Robbie as the irascible and psychotic Harley Quinn is a joy to behold, capturing the absolute crazy essence of the character and injecting a small amount of pathos in for good measure, when she and her ‘Puddin’ The Joker share the screen together the atmosphere is absolutely electric. And backing up this terrific trio are an eclectic and entertaining group of characters, with Viola Davis’ turn as Amanda ‘The Wall’ Waller being a particular stand-out. Like her comic-book counterpart, Task Force x‘s creator Waller, is a no nonsense, hard edged and duplicitous persona and is fundamentally more amoral, than any member of her Suicide Squad. Jay Hernandez must also be complimented for his turn as El Diablo, Suicide Squad’s second most powerful member (after Cara Delevingne’s Enchantress) who harbours a dark and tragic secret so painful, that he refuses to use his powers to hurt anyone. And lest we forget, Jai Courtney as Captain Boomerang who elicits more than a few laughs as the Squad’s resident antipodean Supervillain. Karen Fukuhara as Katana, hired by Waller to keep the Squad members in line (and ultimately end them, should they leave said line) Cara Delevingne as The Enchantress, an ancient and insanely powerful Witch who possesses the body of June Moone, the girlfriend of the Suicide Squad’s appointed leader Rick Flag (Joel Kinnaman) and not forgetting man-beast and constant thorn in the Dark Knight’s side, Killer Croc, ferociously played by Adewale Akinnuoye-Agbaje. 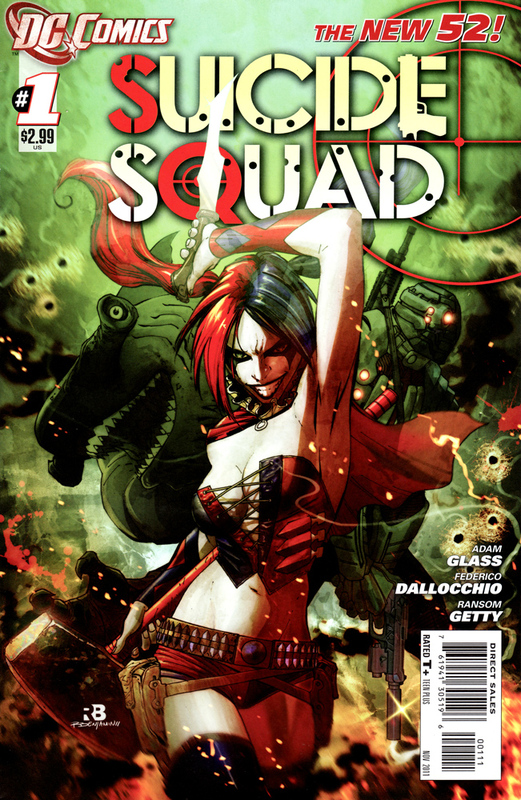 David Ayer’s Suicide Squad ably captures the look and feel of the original comic-book series, in fact original Squad creator, the legendary John Ostrander hails it as an accurate and masterful recreation of his source material, and that is high praise indeed. For all the mixed reviews it has so far received, once again fans and movie lovers have ignored the critics and have turned out in their droves to support the film. It is currently the biggest movie on the planet, and box office takings have been huge easily surpassing other recent comic-book adaptations including Captain America: Civil War and Guardians of the Galaxy. Fun, silly, over the top, and reverential to it’s source… Suicide Squad is a must watch! And the excitement continues fellow DC Comics fanatics, hot on the heels of the fantastic Batman v Superman: Dawn Of Awesome, comes a brand new trailer for everyone’s favourite team of malicious Malcontents – Suicide Squad. After the magnificent trailer that was released just a few short weeks ago, this particular fan has been chomping at the bit for more footage of not just the Squad themselves, but especially Jared Leto as the Clown Prince Of Crime, and the trailer does not disappoint, lots of Leto, lots of Harley Quinn and as an added bonus, lots of Batman! That’s right Batfans, it has been confirmed that Ben Affleck‘s superior take on the Caped Crusader will have a considerably larger role in the film than previously thought. Look out for the highly anticipated second trailer releasing on Tuesday 19 January as part of the CW channel’s 30 minute special titled – “DC Films presents: Dawn of the Justice League” right after the mid-season premiere of the second series of The Flash. Suicide Squad will be released in August 2016 as part of DC Comics’ extended universe of interconnected movies that began in 2013 with Man Of Steel and continues through Batman v Superman: Dawn Of Justice, which is due March 2016. New comics Wednesday is upon us once more, and of this week’s new releases, the stand-out cover for this particular DC fan is; Convergence: Suicide Squad #2. A stunning cover that evokes a real 70’s grindhouse movie poster look. A classic line up of Suicide Squad members come together to face off against the heroes of the 90’s mini-series, Kingdom Come. With all the attention on David Ayer’s upcoming movie version of the Squad, this line up includes many of the characters that will be appearing in the film adaptation including, Amanda (the Wall) Waller, Captain Boomerang and Deadshot. 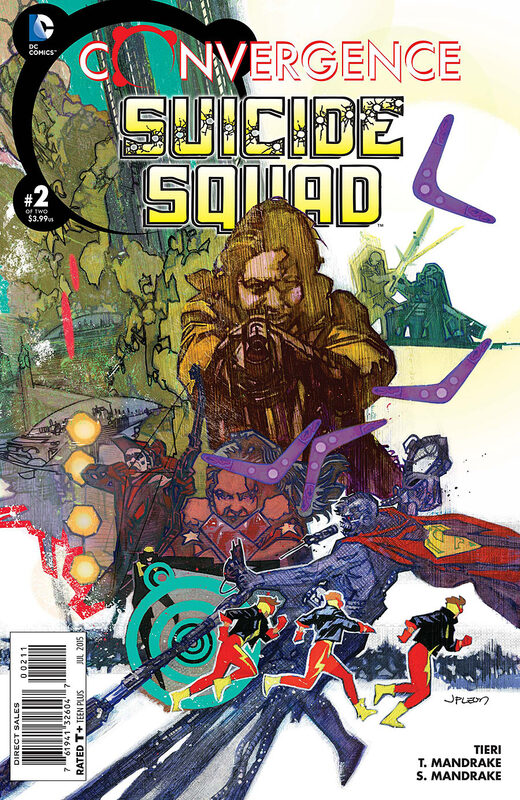 Convergence: Suicide Squad #2 is available at your local comic-book emporium right now. Written by: Frank Tieri. Cover art by: John Paul Leon. 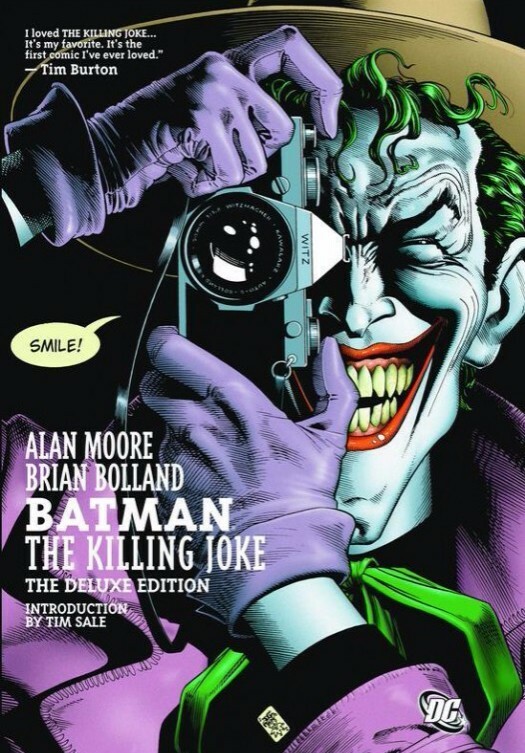 Alternate cover by: Chip Kidd. Interior art by: Tom Mandrake. Director David Ayer earlier today released the first picture of the cast of his upcoming movie, Suicide Squad, together in full costume. The 2016 movie is based upon DC Comics popular team of villains and anti-heroes, also known as Task Force X. 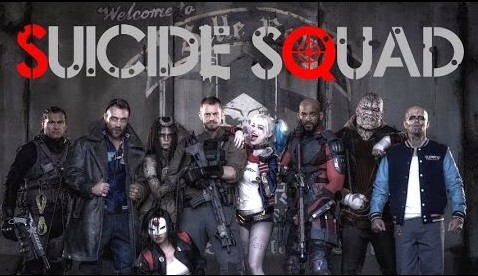 The above image shows the full line up of characters, from left to right; Slipknot (Adam Beech), Captain Boomerang (Jai Courtney), The Enchantress (Cara Delevingne), Katana (Karen Fukuhara), Rick Flagg (Joel Kinnaman), Harley Quinn (Margot Robbie), Deadshot (Will Smith), Killer Croc (Adewale Akinnuoye-Agbaje) and El Diablo (Jay Hernandez). 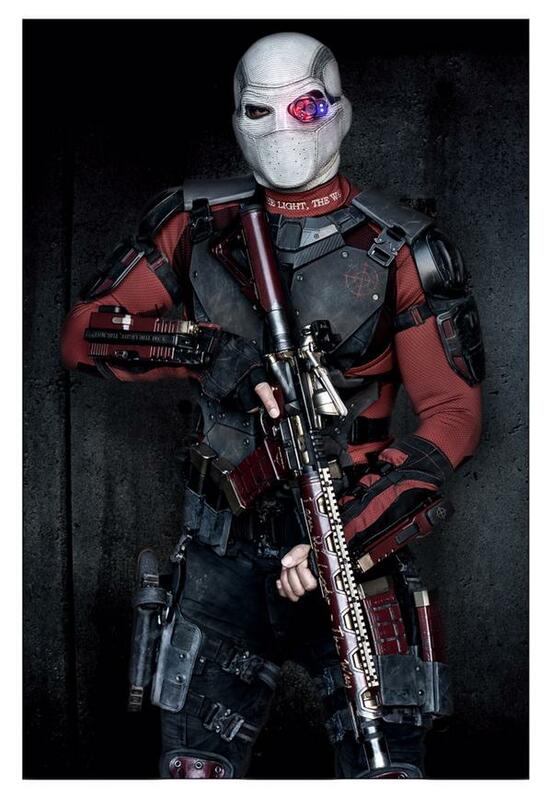 And there’s more, DC fans, shortly after the release of this picture, Ayer then tweeted a separate picture of Will Smith replete with the iconic Deadshot mask. 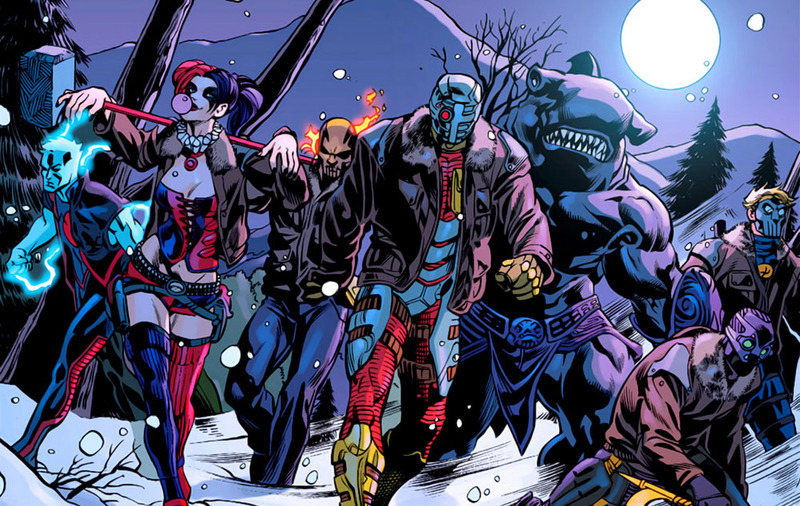 Suicide Squad will be released by Warner Brothers in 2016, alongside Zack Snyder’s “Batman v Superman” as part of DC Comics’ unfolding cinematic universe. 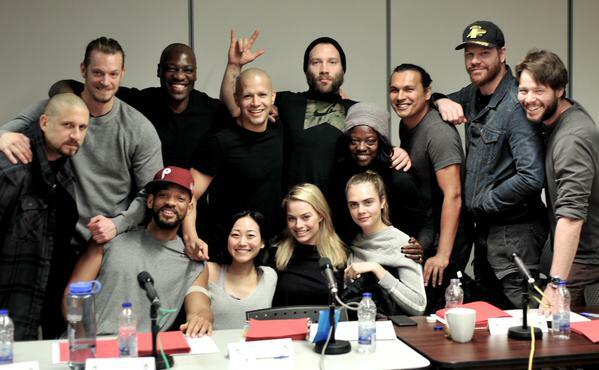 Yesterday morning, film director David Ayer tweeted our first look at the cast of the 2016 scheduled Suicide Squad movie. 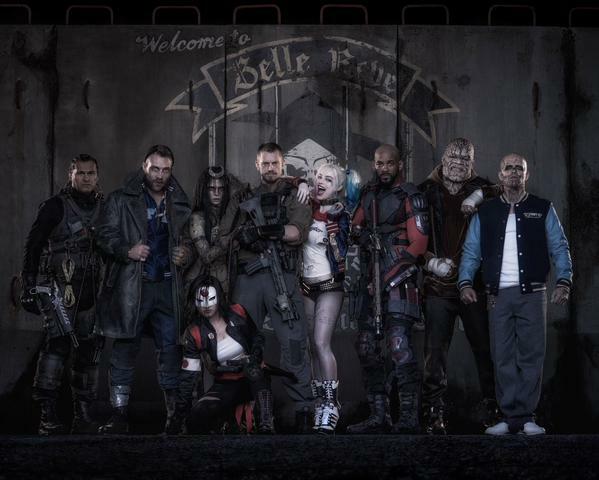 The cast photo included announced actors, Will Smith (Deadshot), Margot Robbie (Harley Quinn), Joel Kinnaman (Rick Flagg), Jai Courtney (Captain Boomerang), Cara Delevinge (The Enchantress), and Viola Davis (Amanda Waller). Interestingly the photo shows other actors also cast in the movie in as yet unannounced roles, but it is rumoured that Adewale Agbaje will be playing Killer Croc, and actors Jim Parrack and Ike Barinholtz,will apparently be playing Deathstroke and Hugo Strange respectively. Conspicuous by his absence of course is Jared Leto, the actor cast as the The Joker. 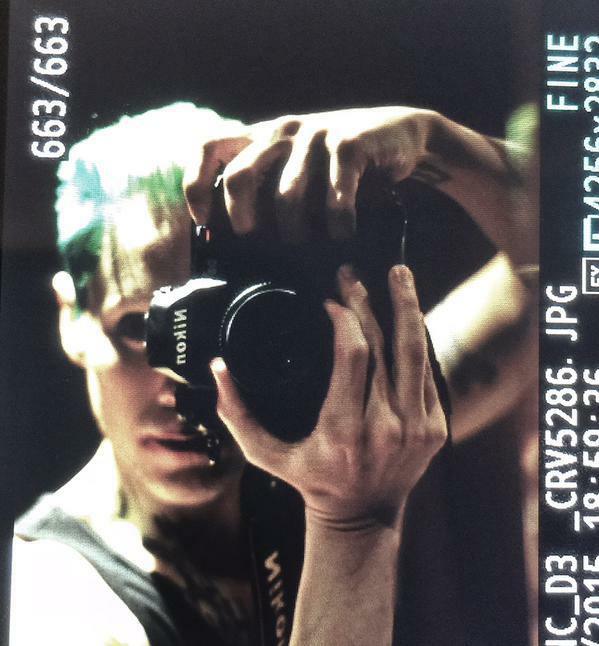 It is believed he was touring with his band at the time, but this morning David Ayer tweeted this (probably intentionally) blurry photo of Leto, with the clown prince of crime’s trademark green hair on show. The most striking thing about this particular photo is its similarity to the cover of Alan Moore’s classic Batman tale, The Killing Joke. The Suicide Squad (aka Task Force X) were created by Robert Kanigher and Ross Andru in 1959, making their first appearance in Brave and the Bold #25. They are a Government funded, covert black ops team of ex-supervillains and disgraced superheroes. The film is scheduled to be released in 2016, alongside Zack Snyder’s, Batman Versus Superman: Dawn of Justice. Update: Actress Karen Fukuhara, seated next to Will Smith in the above group photo, has now been confirmed in the role of Katana. 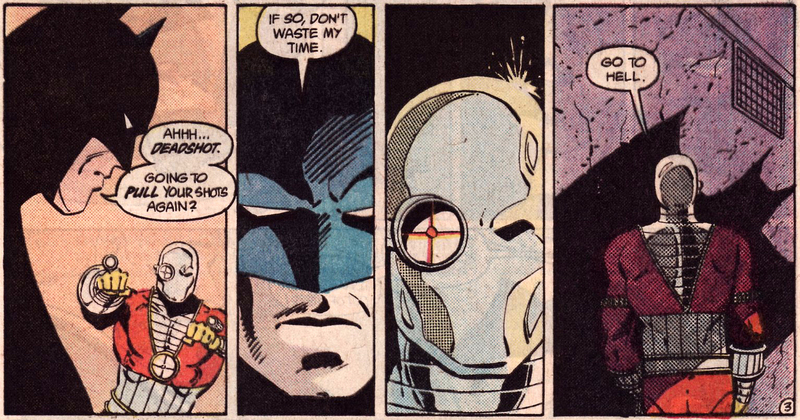 Super-Villain Sunday this week brings you master marksman and the world’s most dangerous contract killer, Deadshot. Created by Bob Kane, David Reed and Lew Schwartz in 1950 primarily as a new villain for Batman, and making his debut appearance in Batman #59. On his first appearance in Gotham City, he was initially thought to be a new crimefighter, but was later revealed to be an enemy of Batman, when he was exposed attempting to become the new king of Gotham’s underworld crime syndicates. Deadshot (real name: Floyd Lawton), grew up with his mother, very abusive father and older brother, whom he idolised. During one of his father’s numerous brutal attacks on his brother, Floyd picked up a rifle with the intent of stopping his father’s abuse once and for all. Taking position in a nearby tree and steadying himself for the shot, Floyd felt righteous in his attack, however the branch of the tree he was sitting on broke as he took his shot, causing Floyd to accidentally shoot and kill his brother. The psychological effect this had on Floyd is deemed what turned him into a murderous assassin, with a disregard not just for the lives he takes, but also his own. Deadshot has been a major player in the Suicide Squad for many years, where his marksmanship skills and almost complete disregard for human life are seen as a major advantage for the covert black-ops, Government run group of ex-Supervillains and disgraced Superheroes. His most noticeable trait, is his utmost desire to die in a magnificent fashion, which is the reason he joined the clandestine squad in the first place. 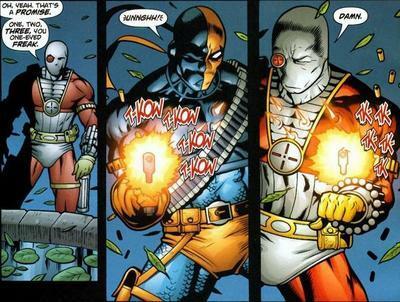 Deadshot is also an on/off member of other villainous teams including Secret Six (which hosts many ex-Suicide Squad members), Killer Elite, and Checkmate. 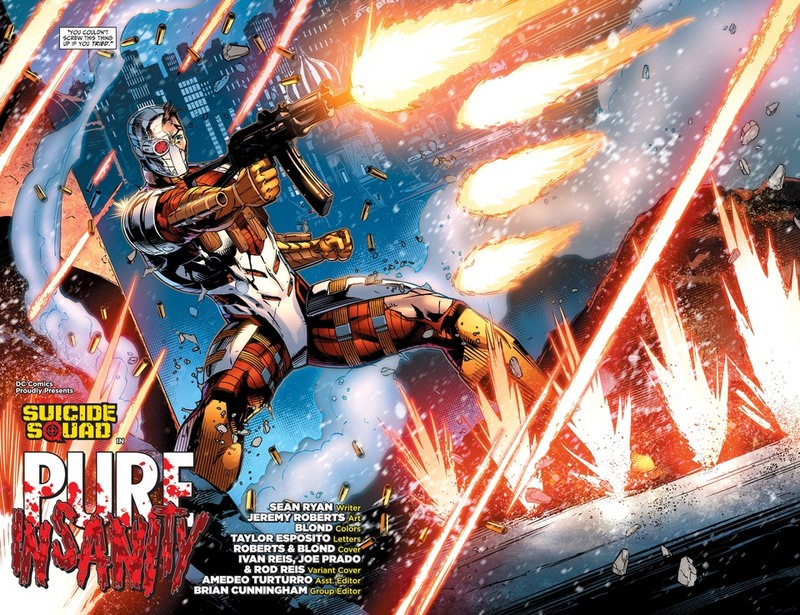 Deadshot’s abilities include the expert use of all firearms, exceptional martial arts prowess and a cybernetic eye, built into his iconic costume, which grants him unparalleled accuracy, plus up to the minute mission data and target acquisition. Soon to be seen on the big screen in the upcoming David Ayer directed movie Suicide Squad, which is being released by Warner Brothers in 2016. With the titular role of Deadshot being portrayed by actor Will Smith, who actively campaigned for the role being a big fan of the comics themselves. Deadshot Reading Recommendations: Secret Six: Villains United. Deadshot: Beginnings. Suicide Squad #1: Kicked In The Teeth. Well friends, after many months of speculation Warner Bros have finally announced the line up for the upcoming Suicide Squad movie and what an interesting and eclectic cast it is. Will Smith will be playing super-assassin Deadshot, Tom Hardy is Rick Flag (and not reprising his role as Bane as I thought he might), Jared Leto has been chosen as the clown prince of crime himself The Joker, with his partner Harley Quinn being played by Margot Robbie. The Enchantress will be played by Cara Delevigne and Jai Courtney has been cast as Captain Boomerang. As I said very interesting casting choices here, there is still the role of squad leader Amanda Waller up for grabs but so far I am more than happy with the cast as is, and the inclusion of the unstable yet powerful witch Enchantress is awesome, I love that character. Critically acclaimed director David Ayer will be directing and again he is an inspired choice with previous movies like Training Day, End of Watch and more recently Sabotage being realistic, gritty and violent flicks, his style will suit the Suicide Squad perfectly. The Suicide Squad were originally created by Robert Kanigher and Ross Andru in 1959, making their first appearance in The Brave and the Bold #25. They were re-booted by John Ostrander in 1987, they are primarily a Government funded black ops team of Super-villains and disgraced Super-heroes, running covert missions out of their home base of Belle Reve prison under the watchful eye of ‘The Wall’ Amanda Waller (who has already been seen on the big screen in the recent Green Lantern movie, played by Angela Bassett). 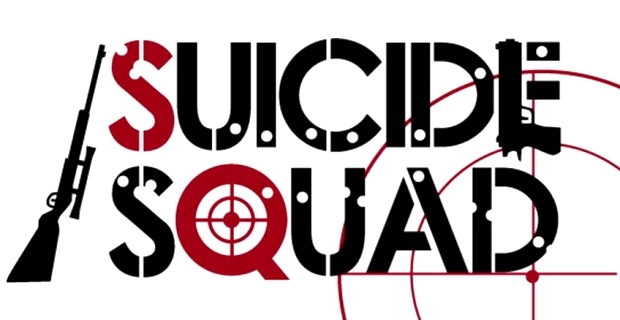 Suicide Squad begins principal shooting in April 2015. DC Comics and Warner Bros have announced that they will be making a live action film of the Suicide Squad comic-book, though no deal has been made as of yet, Warner have said they are interested in having David Ayer direct the proposed film, Ayer is best known for the movies Training Day, End of Watch and more recently Sabotage. The Suicide Squad was originally created by John Kanigher and Ross Andru in 1959, with their first appearance in The Brave and the Bold #25, they were then rebooted in 1987 by John Ostrander for Legends #3. The more recent version of the Suicide Squad are a team of formerly incarcerated Super-Villains, who are used as a special ops task force for the United States Government. 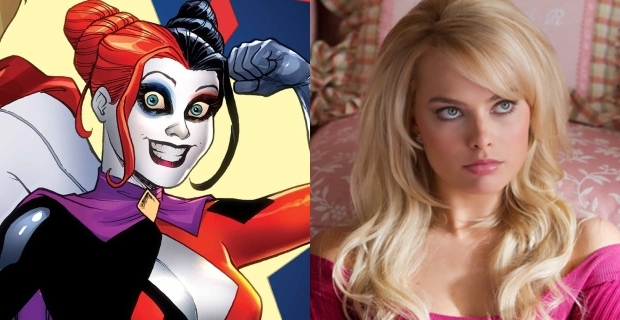 Counted amongst their numbers have been characters such as – Count Vertigo, Captain Boomerang, Deadshot and more recently Mistress of Mischief herself Harley Quinn. Precinct1313 Anticipation Rating: We can ‘Harley’ wait!